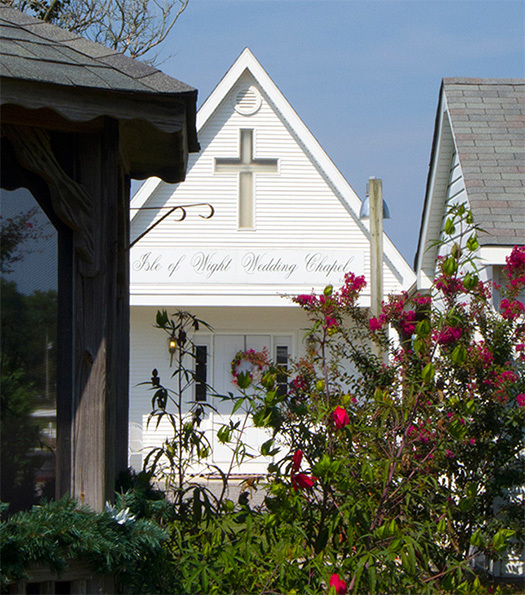 The chapel is located on our beautiful family farm in Windsor VA, which accentuates the country setting in historic Isle of Wight County. The wedding chapel will seat up to 60 of your family and friends, making it the ideal choice for an intimate wedding. The beautiful interior with a 14-foot ceiling and hand-crafted benches provides the illusion of a time long past. And, although in the country, the wedding chapel is within minutes of historic Smithfield Virginia and within one hour of either Richmond, Virginia and Virginia Beach. We also serve all of Hampton Roads including Newport News, Williamsburg, Norfolk, and Hampton. You can see more of the wedding chapel by clicking on the Chapel Interior button or the Chapel Outside button.